Uber and Lyft are net contributors to West Hollywood traffic, if the city is anything like New York, San Francisco or other urban areas where their impact has been analyzed. That is according to a new report by WeHo By the Numbers. The report relies on a seven-city survey and individual studies conducted in San Francisco, New York and Denver. Los Angeles was one of the cities surveyed. Businesses such as Uber and Lyft are called transportation network companies (TNCs). In some ways, TNCs can reduce traffic. For example, they make carpooling convenient and cheaper than their main service. They also provide “first-mile-last-mile” links to transit lines such as Metro Rail. 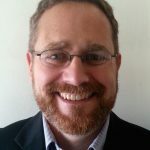 However, recent studies suggest that, on balance, TNCs add to the number of vehicle trips, the number of vehicle miles per trip and the total number of vehicle miles traveled (VMT). The other half of TNC trips are replacement vehicle trips. The user would have taken a vehicle — such as his or her own car or a taxi — if TNCs were not available. The accompanying chart shows new-versus-replacement estimates from three user surveys. The new vehicle trips are red and orange. The replacement trips are green. 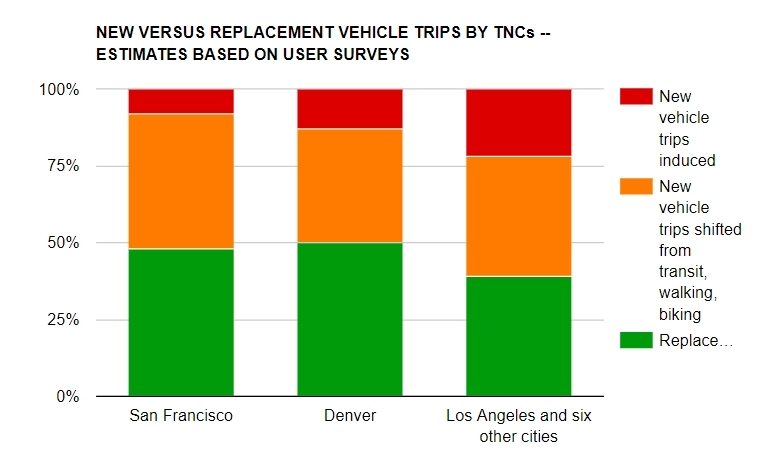 In the San Francisco and Denver surveys, roughly half of TNC trips were new vehicle trips. In the third survey, the number was even higher. It was about 60%. That study covered Los Angeles, Boston, Chicago, New York, San Francisco, Seattle and Washington, D.C.
A smaller but significant number of TNC trips came from induced demand. TNC service was so appealing that users made extra trips they would not otherwise have made. Those trips are red in the chart. They ranged from 8% to 22% of TNC trips. Even when a TNC trip replaces a private car trip, it can still add vehicle miles. The TNC driver may have to travel some distance to reach the rider. When the trip is over, the driver may need to drive to a different area to await the next job. It is called “deadheading.” It means the average TNC trip is longer than the private car trip it replaces. The volume of TNC trips can be high enough to raise the total miles driven by all vehicles in a city. For example, TNCs added an estimated 7% to total VMT in Manhattan and nearby parts of Brooklyn and Queens from 2013 to 2016. The impact was smaller (2%) in the rest of the city. How big is a 7% increase in VMT? If New York City started charging cars to enter the busiest areas of Manhattan, it would reduce VMT by an estimated 6%. So 7% is a significant increase in traffic. Given the size of West Hollywood, a Manhattan neighborhood might be a better analogy than the whole borough. The New York report did not calculate VMT at the neighborhood level, but it did show TNC/taxi growth rates for a few neighborhoods. They ranged from 6% to 121%. That suggests the VMT impact could be much higher than 7% in some neighborhoods. For more information, see the full report, Do Uber and Lyft add to West Hollywood traffic? Uber ostensibly, Lyft to a lesser degree and other random delivery services appear to be oblivious and immune to traffic and parking regulations. They fly under the radar and WH Sheriff Deputies are nowhere in sight. Blocked driveways, blocked traffic, illegal turns, unnecessary fender benders. It all adds up to lawless driving in West Hollywood. As a driver in West Hollywood I have found it more and more challenging to get around town in my own car, not to mention more dangerous. Why? Because both Uber and Lyft drivers are constantly dropping off and picking up in the middle of the traffic lanes and could care less whether other drivers are blocked or worse. We need some enforcement of traffic laws the rest of us do our best to obey. Seems to me these drivers could care less about traffic regulations and will stop anytime anywhere, even at fire hydrants to drop off or pick up passengers. When will they have to abide by the same rules as the rest of us?